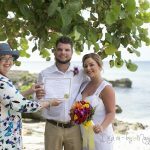 The bride's parents live and work in Cayman, and contacted me months ago to book the date. 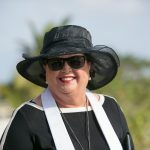 Holy Saturday is a popular day for local weddings, and a day I don't usually do beach weddings because all our beaches are chock-a-block with people camping out for the long Easter weekend. However, after checking out several popular wedding beaches the bridal couple chose this quiet spot off Boggy Sand Road. In the background is the sea-wall constructed after Hurricane Ivan. The petite bride was stunning in a coco-rum lace bridal gown, and carried a bouquet of white hydrangea and mini calla lilies. The wedding started at 6 pm, as sunset is getting later now as we get closer to summer. I took this shot as I was leaving from near the sea wall. The point of land near the setting sun is called Northwest Point and it is in the district of West Bay. 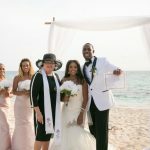 This is the northern -most part of Seven Mile Beach, and since it is just opposite our office, the area where we do most of our sunset weddings. 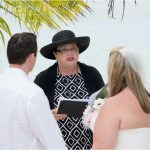 This ceremony by Joy for Simply Weddings, call me for your own Cayman Sunset Beach Wedding (345) 5256551.